A glorious and flavorful Mediterranean salad with crunchy pan roasted chickpeas, this meal is perfect for game day or any day in-between. 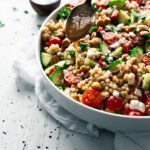 This chickpea salad is a fun and funky twist on a traditional Greek salad, with pearled couscous and a vinaigrette based off my famous dressing. 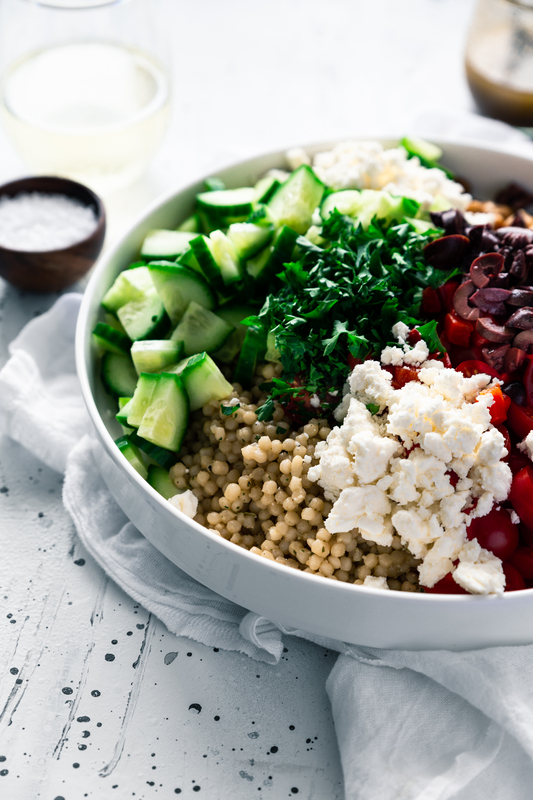 If you follow my meal prep tips, you can enjoy this salad for up to four days! 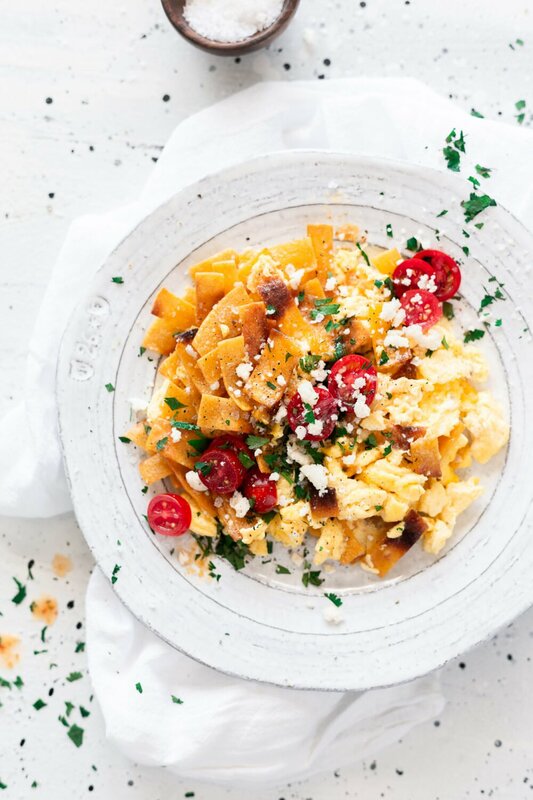 Most of you are very familiar with my love for Greek and Mediterranean flavors. 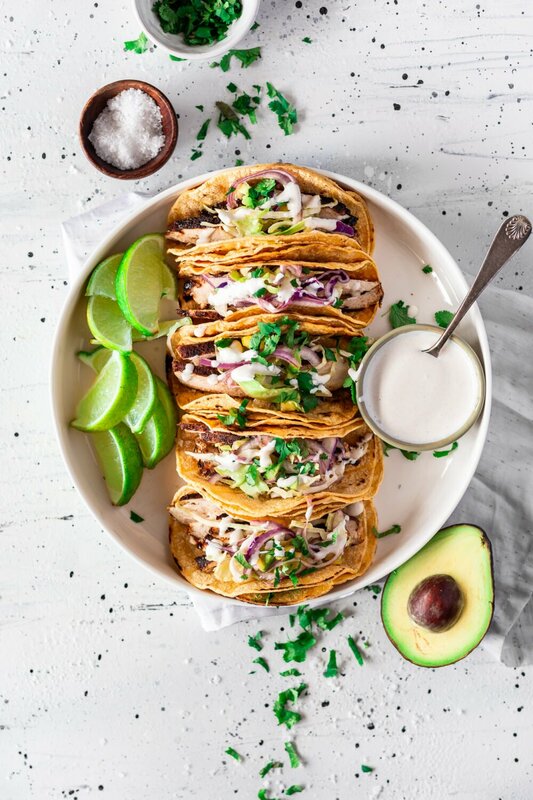 From my chickpea tacos to my Greek lamb bowls, it’s easy to say I’m obsessed. I started with my classic Greek salad, and then went to town, eliminating the lettuce, and adding chickpeas and couscous! I took it even further by switching up some of the ingredients in my signature dressing and voila! Deliciousness abounds. 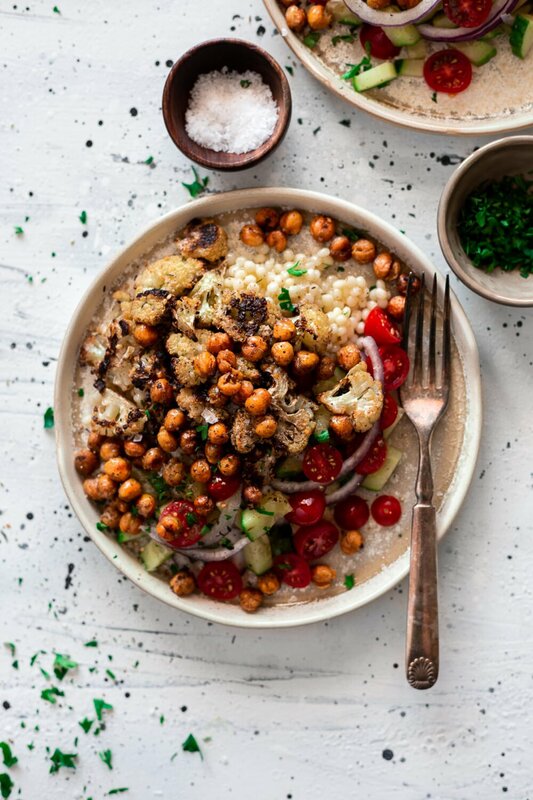 We’re pairing this chickpea salad with some amazing Decoy Sauvignon Blanc and serving it for game day, because I’ve had one too many wings and I need something more sophisticated, but still super easy. 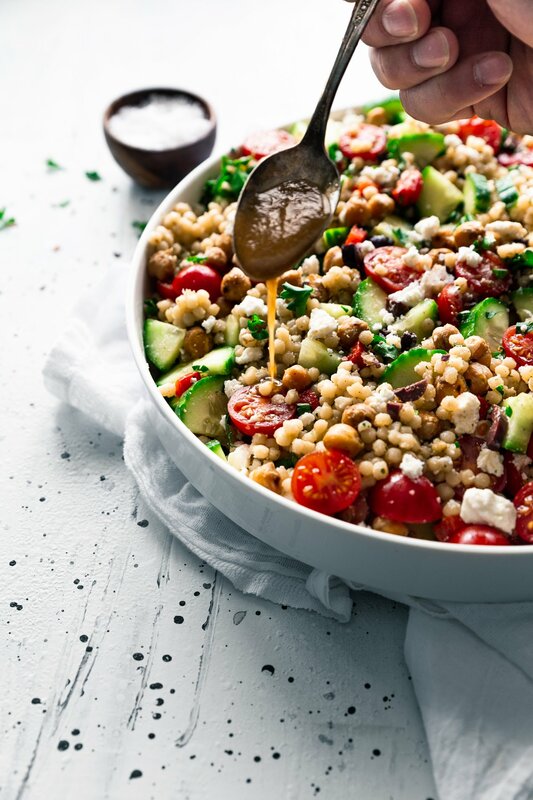 Pearled couscous adds a chewy, nutty flavor to the salad, which complements the crunchy chickpeas. Soak the cooked couscous in some of the dressing to absorb the flavors. Traditional couscous is not gluten free, but gluten free varieties are available. 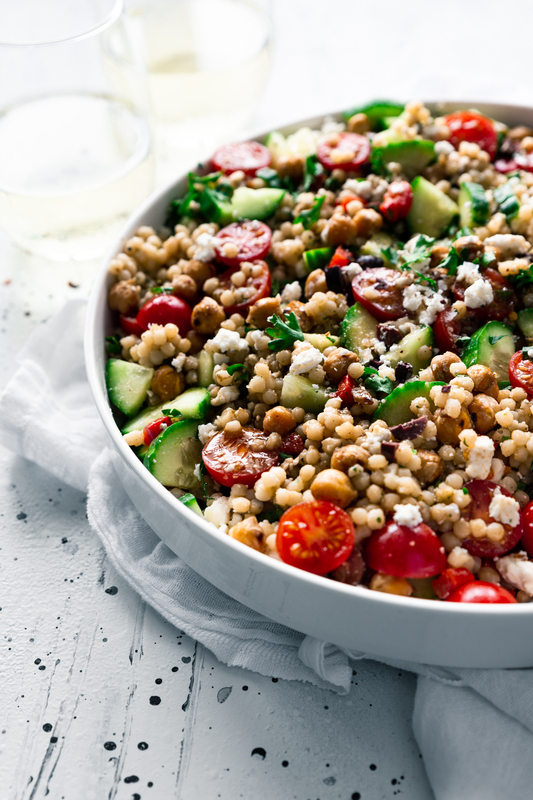 You can use plain pearled couscous, or boxed varieties such as roasted garlic and olive oil. If you used a boxed variety, you don’t need to soak the cooked couscous in dressing. 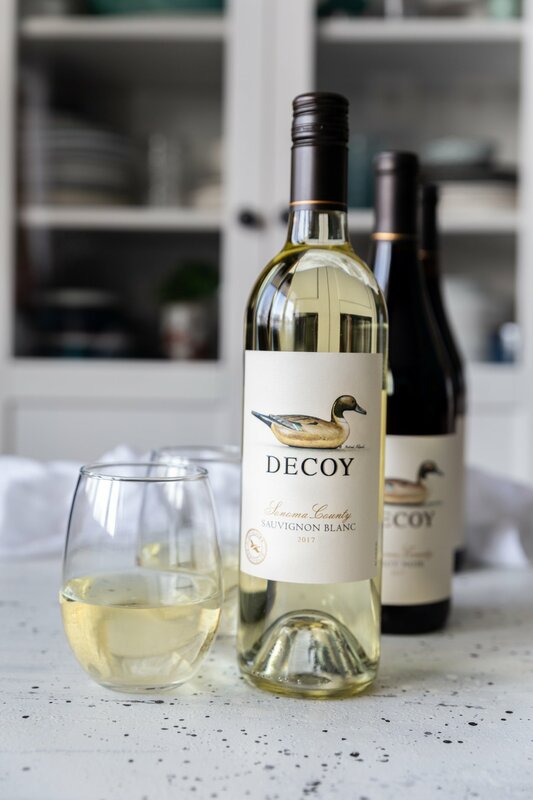 I love the approachable elegance of Decoy Wines. I wanted the perfect meal to go with it for game day, and since I had a couple bottles of Decoy Sauvignon Blanc, I knew I had to go the Mediterranean route. 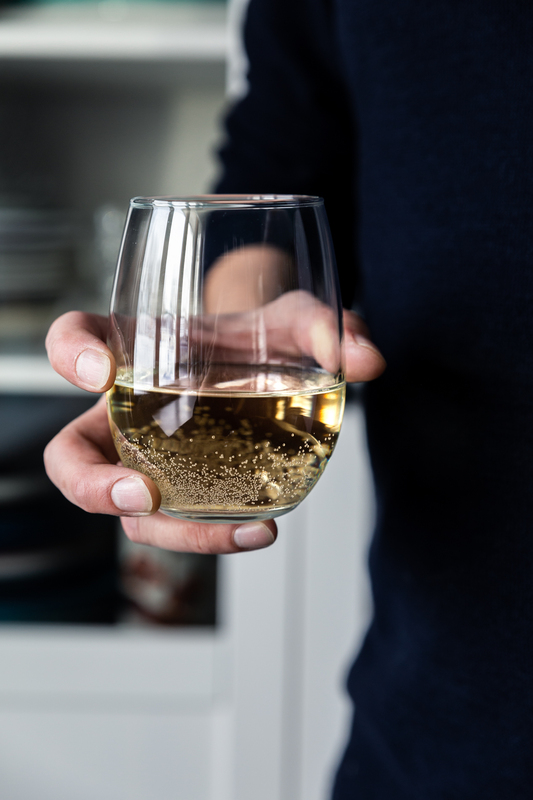 White wine pairs marvelously with light salads, especially salads without beef. The lemon and lime notes in the sauvignon blanc complement the bright flavors of the cucumber and dressing. 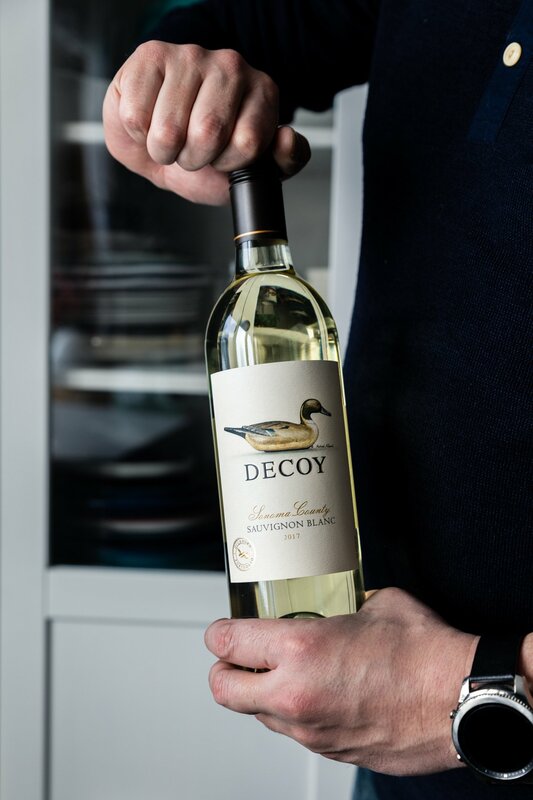 Elevate your game on the big day with this perfect pairing of Decoy Wine and Mediterranean Chickpea Salad! Similar to my chickpea tacos, we’re aiming for that crispy yet soft texture from the chickpeas. 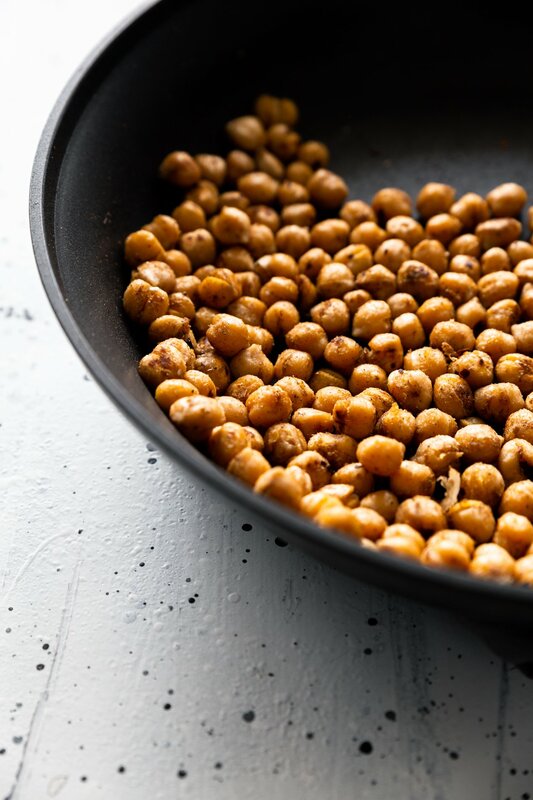 You don’t want to spend an hour roasting chickpeas in the oven, so we’re eliminating that task by using a skillet instead! Rinse and drain the chickpeas well. They don’t need to be perfectly dry, but you don’t want them soaking wet. Toss them in a bowl with a little olive oil and spices, then add to a hot skillet. Roast them in the pan until they are golden brown and crispy on the outside. Cook the chickpeas and the couscous at the same time to cut down on the total cooking time. 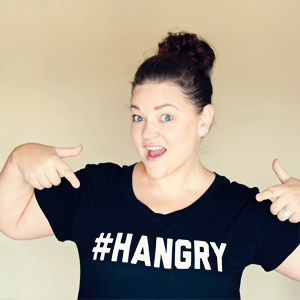 Ready in 15 minutes! 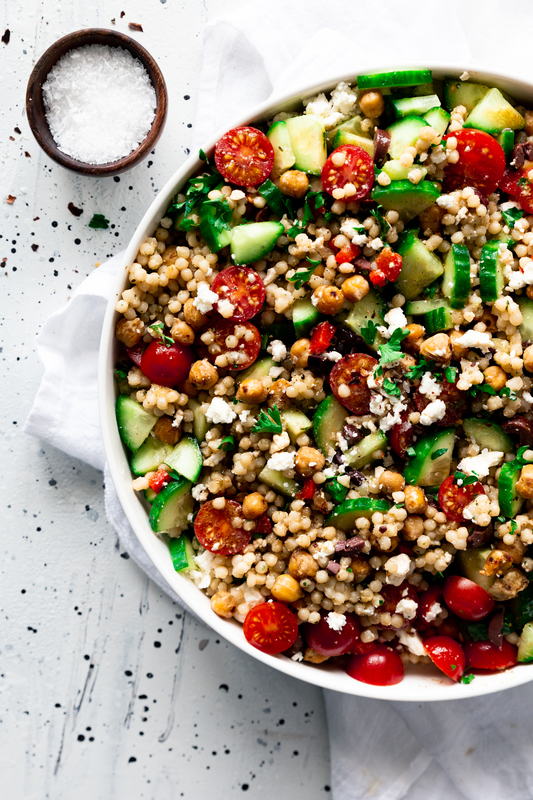 While the chickpeas and couscous cook, dice up all the veggies and toss them in a big bowl. 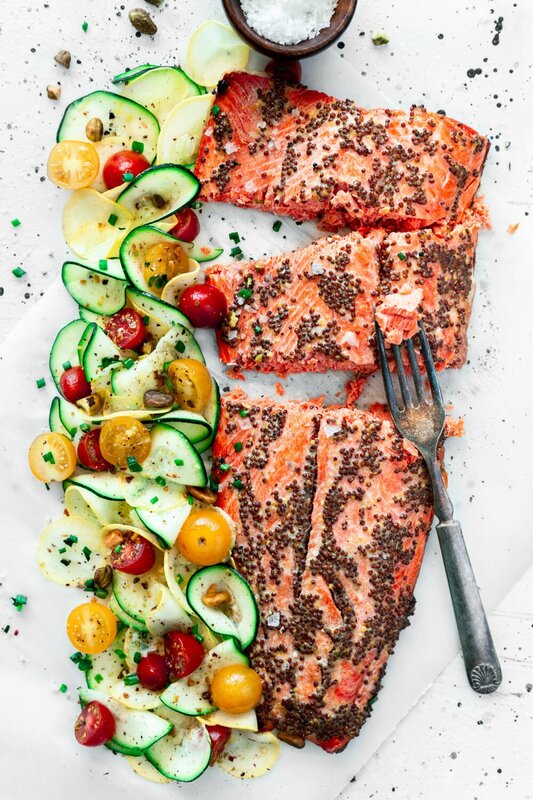 Whip up the super simple dressing during this time as well. 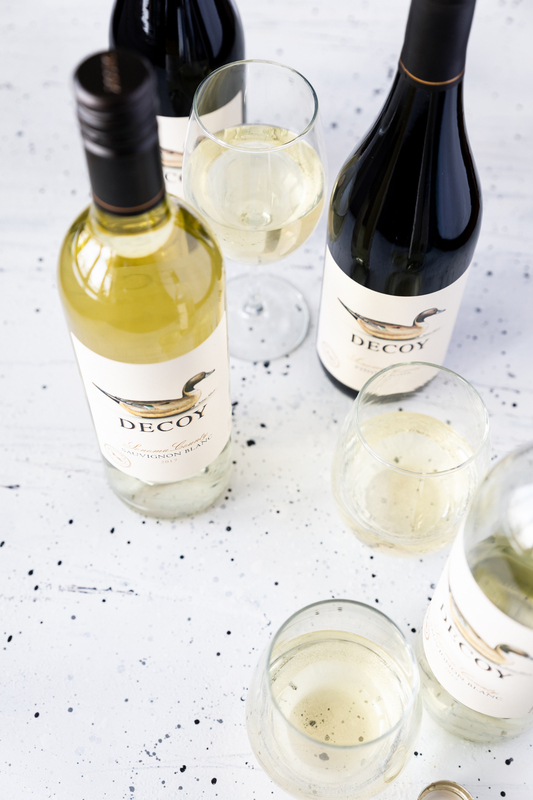 Have a glass of Decoy Wine while you’re working. Get 4 roughly equal-sized containers as well as 4 small ramekins with lids for the dressing. Scoop couscous to one end of the container and the chickpeas to the opposite end. Fill in the middle with the veggies and nestle the dressing container in one corner. The chickpea salad will keep for roughly 4 days so long as the dressing is sealed seperately, making it a perfect work lunch! 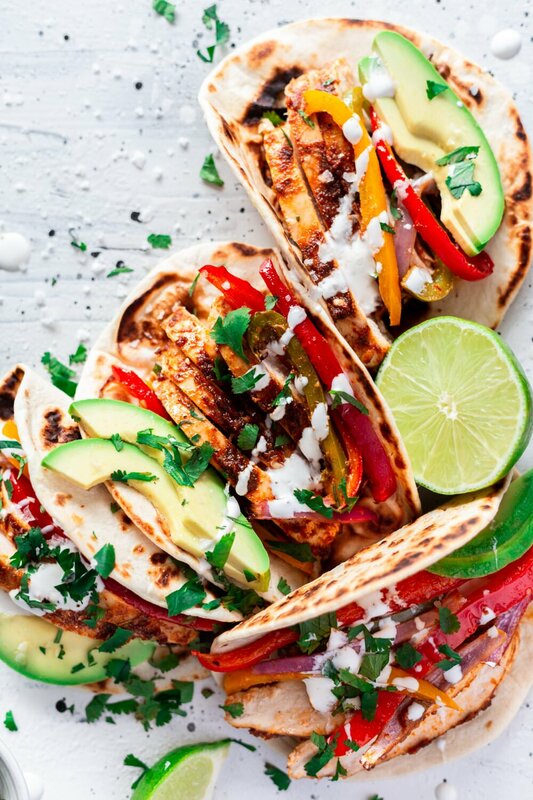 Game day doesn’t have to be about the same boring eats you have every Sunday. 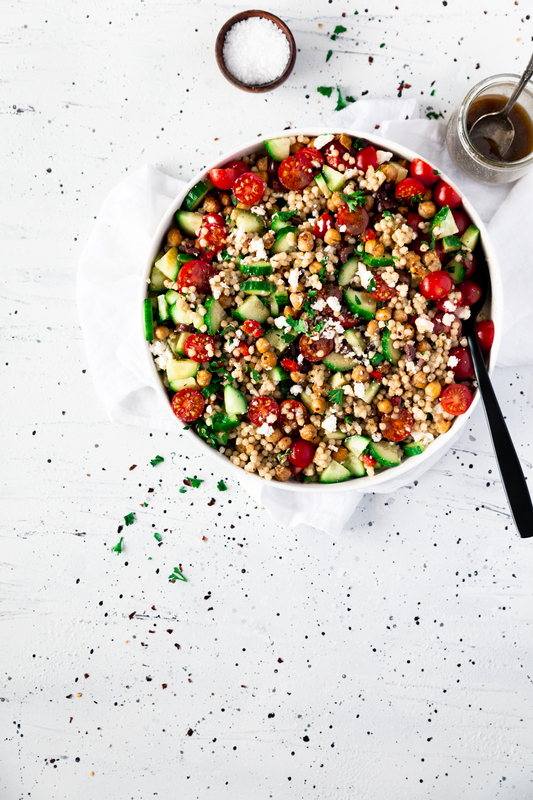 Elevate your game with Decoy Wine and this spectacular Mediterranean Chickpea Salad. It comes together just as quickly as traditional fare, but imparts a more sophisticated flavor. Buy your own bottle and be the hit of the party! I'm always looking for more delicious ways to incorporate chickpeas into our family meals. 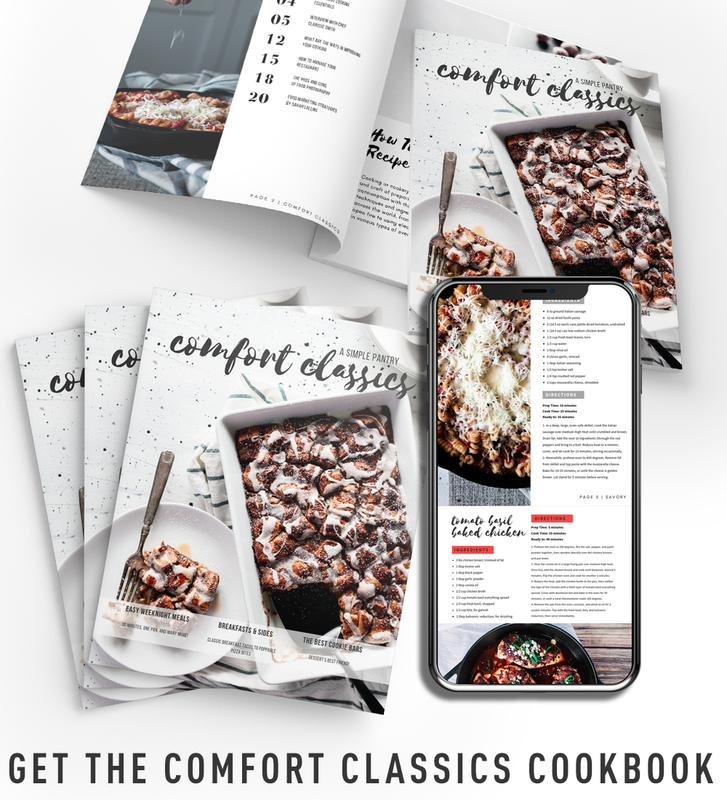 This is one incredible recipe! I LOVE Decoy Wines and this salad is now on repeat over here. So refreshing and satisfying .